I am so pleased to be a Guest Designer for Craft Project Central this month! 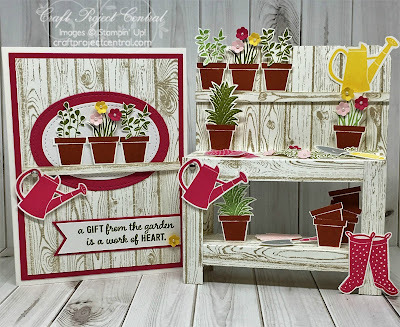 If you love gardening, or have a friend/relative who gardens, they would love receiving this adorable workbench and matching card. The workbench features potted plants and flowers, complete with gardening tools, gloves, and mud boots. The card matches the workbench, and as all gardeners know, a gift from the garden is a work of HEART. This project fits the bill. The workbench is a cinch to put together. The pots, plants, and tools are all hand cut, but oh so worth the effort! The tutorials for making this workbench and card are available at http://craftprojectcentral.com for the month of May. Don't miss this one! If you leave a comment below, I will randomly pick one of you to win a FREE subscription to the month of May on Craft Project Central! Love it, love it, love it! And I love fussy cutting! A very special card! Thanks so much Doris! Yay for another fussy-cutting lover!! Sandy, this project is absolutely awesome!! Love it! Oh my goodness! This is too cute! You amaze me!' I love the watering can hanging from the bench - so clever!! Thank you Elisha! It was so fun to put together! WOW! 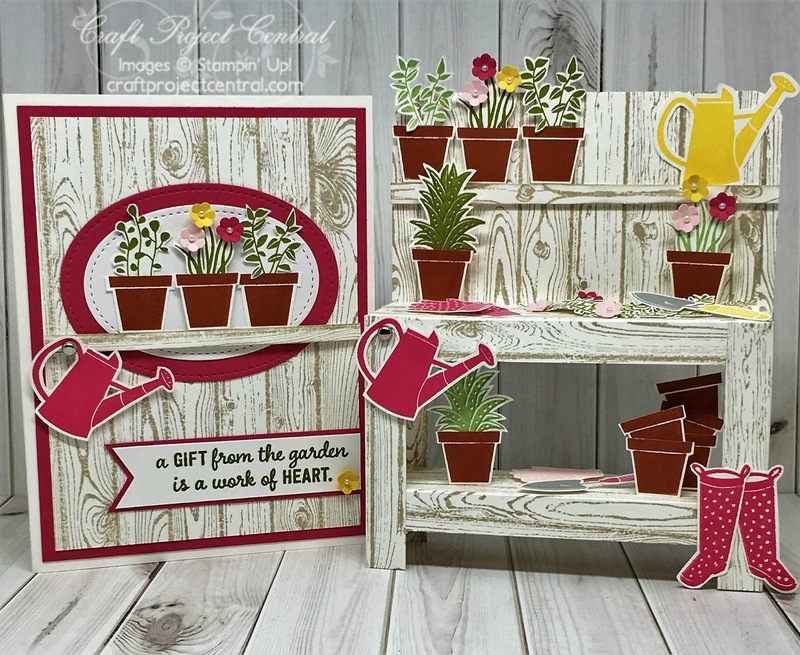 You have certainly out done yourself with this card and garden workbench!!!!!! They are both so AMAZING! Sandy, you are so creative! Congrats on being a GD. Thanks so much Lisa! Stay tuned, I've been asked back again for August! Thanks so much Eileen! And you're welcome- good luck! Your workbench and card are amazing! The fussy cutting you did is excellent! I love all the little pieces that sure are important parts of gardening. The bright colors are so cheerful. My favorite parts are the three little pots and the gardening gloves. Your work is just beautiful! Thanks so much Mary! I love fussy cutting and this project was so fun! Such a wonderful project! And again, your creativity is simply amazing-great job! So gorgeous Sandy! You have outdone yourself! You have inspired my MOJO! Thank you Liz! Happy to trigger that mojo! Hi Sandy! Love this project and subscribed to Craft Project Central for three months to get the luscious details, but I don't find it. Can I presume your project will be added later in May? Thanks! Thanks so much! And so glad they posted it! Sandy, what a stunning card! I love to fussy cut too. It makes it just that much more special. Hooray to fellow fussy-cutters! So glad you like it - thank you! Your card is so cute-I love it and can't wait to make one(or several)! I can see a few other uses for it also, perhaps a tool bench for Fathers Day or a desk for a teacher. Thank you for the wonderful tutorial. Thank you so much Judy! Enjoy! Thanks so much Leslie! So fun to make! OMG I love this project. I am a gardener and have a potting bench. Thank you so much for sharing. Great job!! I love the project. I am an avid gardener as was my Mom. I have a lot of her perennials growing in my garden. This reminds me of her so much. Thanks for sharing such a lovely project. You really worked hard on this one! Thanks so much Sharon- so glad it brought you such lovely memories! This is SO CUTE!!! I love this stamp set and can't wait to make this for a gardener friend of mine. Does the workbench fold down flat like the card does? No, I'm sorry it does not. Thank for sharing the great post!!! Hi Sandy, I have only just found your Beautiful card, my friend is garden mad and I would like to purchase the tutorial to make this for her.